Remember, voting online is UNLIMITED. You do not have to vote for all of the match-ups. You can simply use “Joe” as the required Nickname and you must enter the CAPTCHA security code to ensure a valid vote. If you cannot read the words it gives you just refresh the code by clicking on the circular arrow icon in the CAPTCHA code box. Each match-up lasts 1 full week so be sure to check back and VOTE EVERY DAY!! This week’s match-ups are not over yet so Joe’s official playoff ranking is not determined. The playoffs consist of the top 8 mascots and a loss is an automatic elimination. So, JOE MUST WIN TO CONTINUE ON!!! The Quarterfinals start Monday Nov 22nd with Joe facing up against UTEP’s Paydirt Pete for the second time this season. Our previous bout with Paydirt Pete was an intense one that stayed close all week long. Joe Vandal accumulated over 100,000 votes that week!! We must rally voters over Thanksgiving break and make sure we tell everyone to GO ONLINE TO VOTE!! Thank you to everyone who has sent in votes for Joe during this challenge! It’s a fun competition that has really given Idaho and Joe some good publicity. Keep showing your spirit! GO VANDALS!! The Vandal Nation showed its love for Joe again last week! Joe ended up beating LSU’s Mike the Tiger by ~10,000 votes. This win kept Joe in 6th place but strengthened his vote total which is VERY important in these final weeks leading up to the playoffs. This week Joe has an intense battle against Montana’s “Monte”. Monte fans have brought over 100k votes THREE TIMES so far during the challenge and Monte currently sits in third place overall. Joe and Monte have been trading leads this week but Joe is currently (Wednesday) behind by about 1500 votes. Nothing insurmountable but we really need to encourage more people to vote for Joe!! Remember, you can cast UNLIMITED votes online at http://www.capitalonebowl.com/vote/main It is important to know this website because for the playoffs the only form of voting will be ONLINE voting- no text voting in the playoffs (which is in just a couple weeks!). With all this exciting talk of playoffs we can’t get ahead of ourselves…let’s take a look at what challenges Joe still has to face in the regular season. This week is the tough competitor Monte, next week Joe faces the equally tough (just behind Joe at #7) Cincinnati Bearcat followed by the also fierce Tennessee (sitting at #8 currently). That brings us to the end of the regular season and Joe will have to be ranked in the top 8 to continue on. Each of these remaining battles will be TOUGH and probably very close. SO TELL EVERYONE YOU KNOW TO VOTE FOR JOE!!! The “strategy” for the remaining weeks is to remain in our #6 spot (or move up). This means we have to keep our eyes on those just behind Joe- UC Bearcat, Tennessee, Big Red of WKU, and Vanderbilt’s Mr.C – we want to see these foes lose in the next few weeks while we pull out wins. That way we will stay ahead of them by Win/Loss records. We also need to beef up our total vote count in case we find Joe tied with any of them in Win/Loss. This week we sit at 5-4 which is tied with Bearcat but we are luckily ahead of them in votes by nearly 100,000. They are posting big vote #s this week against Ohio State though. So- don’t give any votes to these competitors in the coming weeks – UC, WKU, Vanderbilt, Tennessee. And do keep in mind that Ohio State supported us heavily against UTEP (and continues to do so) and might make the difference for us in the coming weeks so we need to return this favor!! Especially this week as they take on the UC Bearcat. A loss for UC and a win for Joe would boost us ahead in the Win/Loss record and give us a little bit more confidence in making the playoffs. So- VOTE FOR JOE and VOTE FOR BRUTUS!! They ARE doing the same! 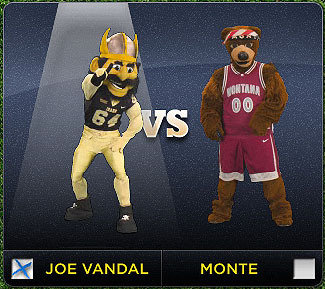 I continue to encourage all you fans out there to post the weekly Joe Vandal Mascot Challenge banner image in your Facebook profile and set your status update as a Vote for Joe reminder to all your friends! We need to show our spirit everywhere we can and that includes online spaces like Twitter and Facebook!! Please share with us any creative things you do to help spread the word! We’d love to hear about your love for Joe!! JOE VANDAL NOW IN 6th PLACE! After a rough and tough battle last week vs. UTEP’s Paydirt Pete, Joe has moved up to #6 in the Mascot rankings! Despite suffering a loss, Joe accumulated 121,758 votes which moved him ahead of all other mascots with the same Win/Loss record. This is a tremendous achievement and we should definitely thank ALL the voters who took time to vote last week! Great job! This week Joe is up against LSU’s Mike the Tiger. Mike may be sitting down in 11th place but he’s looking to make moves. Last week his voters put forth 27,000 votes- so let’s not underestimate him Vandal fans! We have to keep our voting intensity up through these last few weeks. We have some TOUGH opponents to finish out the regular season. Joe’s season ends with, Monte from Montana (3rd), the Cincinnati Bearcat (8th), and Smokey from Tennessee (7th). We need to bring a LOT of votes against all of these opponents in order to stay eligible for the playoffs!! Remember, Joe needs to be in the top 8 to go to the playoffs. AND- for the playoffs voting will take place ONLY online- no text voting in the playoffs!! This week’s focus needs to be on gaining some on campus support and involvement. Other schools are doing a great job of making T-shirts, signs, posters, stickers, sending out emails to students, having the mascot attend campus events, etc. It’s hard to get those things started myself since I am an alum and away from campus- so anyone reading this who IS on campus- let me know what you can do to help out and get the whole campus and community rallied around Joe!! A good, simple way to start is for you to change your Facebook status to read: Vote for Joe Vandal in the Mascot Challenge! Text JoeVandal to 69866 or vote online at http://www.capitalonebowl.com – or something similar. Also – feel free to post an image of Joe as your profile photo such as the one here! I’ll post a new one each week. ***** update regarding image use on Facebook: I’ve replaced the original image with one that will actually post to a Facebook acct. They have to be a specific size. Use it as your Facebook profile image- Joe does!